If we’re going to do a good job of preparing our students to be citizens, then we can’t let social studies be driven by facts and chronology. Instead, it should focus on important themes and essential questions. By placing the emphasis on these themes, we turn facts into tools by which we can understand the world. We learn to read the word in order to read the world. That’s why I’m a huge advocate for using a thematic curriculum in social studies. We don’t all have the luxury of structuring our entire curriculum around themes, but you can at least weave those themes throughout your course and throughout the content. So for today, we’ll look at one theme in particular: Conflict. I’ll share a list of three essential questions that I use in my class to explore this theme as well as a slideshow that you can utilize to facilitate the discussion with your own students. Stay with me to the end, and I’ll share some resources that you can use for other themes as well. I start each year with a set of three questions about conflict. These questions get my kids thinking about some big ideas and then we return to these questions throughout the course. I created a slideshow presentation to help facilitate the discussion. It includes each of the three main questions, some extra probing questions, and a series of relevant images to spark ideas. Below, I’ll go through each of the questions, talk about why it’s important, and share some common things that my students say in discussions. 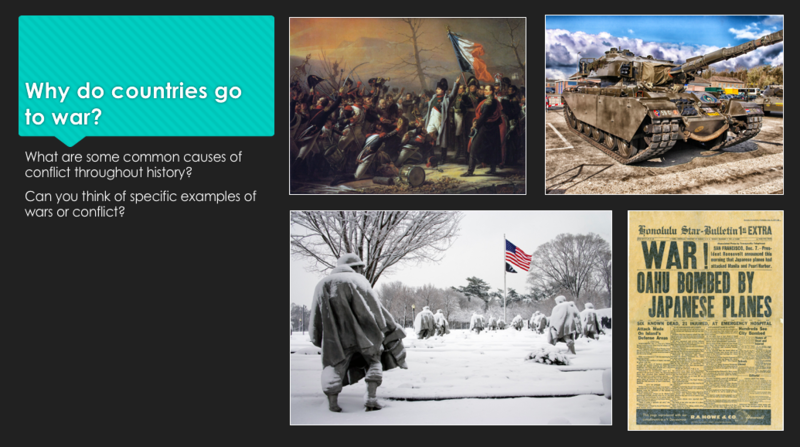 The first slide of the powerpoint, focusing on why countries go to war. This is a seemingly simple question – why do countries go to war? Students should be able to draw on some level of prior knowledge to answer this. Often, the responses start with hypothetical answers – countries go to war to get stuff or to get more land. It’s a little tough nailing students down to specific examples, and this requires some follow up questioning. Students often know about World War II, and it’s easy to make an argument that the U.S. joined the war to protect itself and retaliate against the Japanese attack at Pearl Harbor. Other wars students might know something about include the American Revolution and the Civil War. Sadly, my students often don’t know much about the current wars that the U.S. is involved in. But it’s worth asking them what they know about 9/11 and how that’s connected to the current conflicts in Afghanistan and Iraq. Ultimately the goal here is to both a) think about various causes of war and b) think about how conflicts have multiple causes. Back to the example of World War II, it’s not quite that simple. You also have to think about why the Japanese bombed Pearl Harbor and why the United States stayed neutral in the beginning of the war. Was John Brown right when he led a slave revolt at Harper’s Ferry? 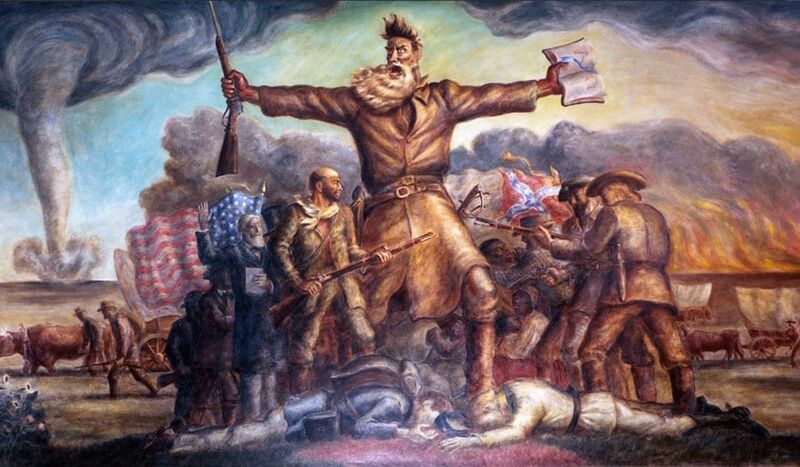 What about when he battled in Bleeding Kansas? Why Should Countries Go to War? This second question transitions directly out of the first, and it isn’t easy to answer unless you’ve established a good list of reasons why countries go to war – to protect themselves, to conquer new territory, to acquire resources, to establish hegemony, to maintain a balance of power, etc. The tougher question is – is this a good reason to go to war? Here, the ideological differences of your students will reveal themselves. Some might think it’s ok to go to war to seize more land or acquire more resources. Some might think it’s never ok to go to war at all. I like to rephrase the question and ask students, “Would you volunteer to participate in a war for this reason?” I think often times these decisions seem impersonal and divorced from reality, but when you have to put yourself in those shoes it’s a different story. And it’s also a very real question. The United States has had a number of conflicts in its day, and many people chose to join the military and serve in them while others have decided not to. Some students may even be considering this very question themselves as they are pursued by military recruiters who try to convince them to join the armed services. This is also an easy question that you can readily return to throughout the year. Each time you study a conflict think about – was this fought for a good reason or no? 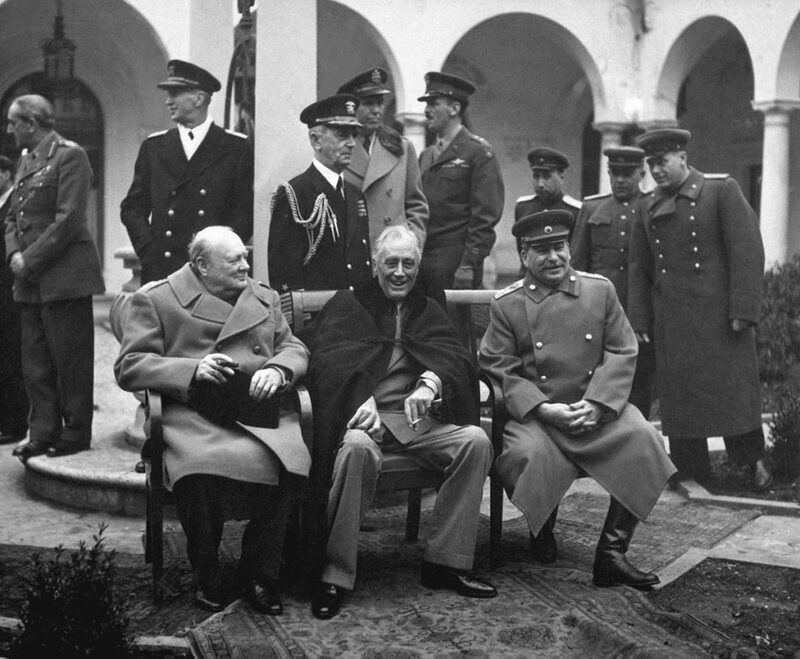 These three – representing the US, the UK, and the USSR – make for some unlikely allies. How is it that they managed to get along? Can Nations Cooperate with Each Other? The absence of conflict is also important, and this last question dives into that. Nations are not always at war, so how is it that they work together and how can they continue to work together? Depending on students’ prior knowledge, this may be difficult to answer early on. Hopefully, they’ve heard about the United Nations, so someone might volunteer something about that. Unless they follow a lot of current events, I’m less sure if they’d know about things like NATO and NAFTA. But you can direct the conversation to focus on reasons why countries may wish to cooperate. Is it in their interest to fight all of the time, or is there a cost to that? Is trade beneficial to countries, and what is the relationship between trade and conflict? This is a complex question with many answers, and political scientists have been debating it for decades. From the old balance of power theory to the democratic peace theory, there are a lot of theories for how and why nations cooperate with each other. But one way or another, this is perhaps the most consequential question for today. How Do These Conflict Essential Questions Fit Into Your Class? Well, that’s your choice. But here’s some insight into how I weave these questions into my class. First, I start the year with a day discussing these questions. 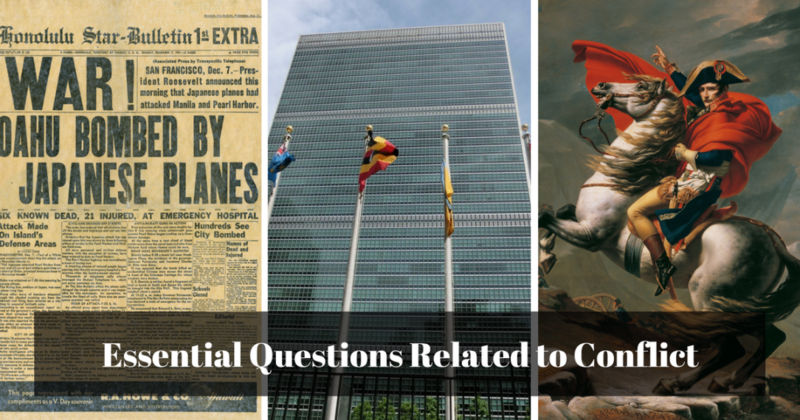 In the first two weeks – whether I’m teaching World, US, or AP Gov – I always spend a few days discussing essential questions from a variety of themes. I want to get a sense of what the students already know and think, and I want to get them thinking about these questions for the rest of the year. Typically, I devote an entire class period to these three essential questions. We start with a brainstorming activity or a Think Pair Share about the first question – why do countries go to war? After we’ve discussed that for a good fifteen or twenty minutes and developed a nice list, I’ll move on to the second question. The third question usually doesn’t generate a lot of activity with my students, so I usually mention it in my closing to put it out there and get them thinking about a few things. It’ll come up later in the year. Then, I wrap up with a writing assignment for homework. Typically, I ask them to describe an example of a time when two countries went to war, explain why they went to war, and argue that this was or was not for a good reason. This essentially ties up the first two questions. I’m not looking for an extensive essay – just a paragraph or two. Throughout the year, we return to these questions again and again. As part of the summative assessment at the end of each unit, I have the students write about one of these essential questions and respond using information they learned in that unit. This makes them re-engage with the question, re-evaluate what they initially thought, and assimilate new information into their understanding of conflict and cooperation. Want a copy of the slideshow to use yourself? Scroll back up and hit the share button. That will unlock the file so you can download it and keep a copy. Conflict is one of five themes that I focus on throughout my course. Take a look at this post for a complete set of essential questions about those five themes. You might also want to read Dr. Beth Rubin’s book, Making Citizens: Transforming Civic Learning for Diverse Social Studies Classrooms. I learned a lot from that book on how to incorporate themes and essential questions into my course, and it’s an excellent read if you want to dig into this stuff more. This blog post also offers some insight into the topic.